3 Bedroom Link Detached House For Sale in Nelson for Asking Price £149,950. Offering a surprisingly large rear garden which offers a fantastic view of Pendle Hill, this linked detached property has been superbly maintained and is a credit to the current vendors. 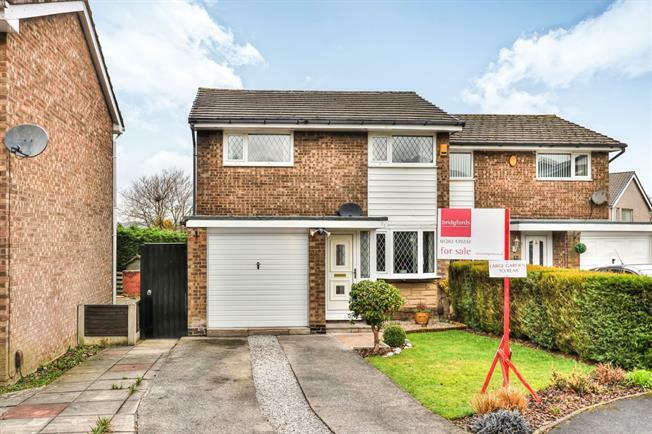 Set in a quiet cul de sac, the property also has the benefit of a superb modern bathroom suite, three well proportioned bedrooms, open plan lounge dining room, immaculate fitted kitchen and generous conservatory. There is also an integral garage which has been split in half and currently offers a study in addition to storage. The property has a modern gas central heating system and benefits from double glazing throughout. There is also a driveway which provides off road parking and an additional garden to the front. UPVC front double glazed door, opening onto the driveway. Double aspect double glazed uPVC windows. Ceiling light. Double glazed uPVC window facing the front. Radiator and electric fire, wall lights and ceiling light, under stairs storage cupboard which provides access to the study. UPVC double double glazed door. Radiator, ceiling light. UPVC double glazed door, opening onto the garden. Double glazed uPVC window facing the rear. Tiled flooring, part tiled walls, ceiling light. Roll edge work surface, wall and base units, stainless steel sink and with mixer tap with drainer, integrated electric oven and gas hob, over hob extractor, space for washing machine, fridge/freezer. Double uPVC double glazed door opening onto the garden. Double aspect double glazed uPVC windows. Economy 7, laminate and tiled flooring, ceiling light. Up and over garage door. Ceiling light. Double glazed uPVC window with patterned glass facing the rear. Heated towel rail, tiled flooring, built-in storage cupboard housing wall mounted boiler, part tiled walls, spotlights. Low level WC, panelled bath with mixer tap, shower over bath, wall-mounted sink and vanity unit with mixer tap, extractor fan. To the rear there is a crazy paved patio with a path that leads to three tier laid to a lawn area. There is also a decked area, a playhouse, a pergola with a seating area underneath and a shed. There is a fenced perimeter, a selection of shrubs and bushes to the border on one side of the garden and a gravelled area. There is also an outside tap. To the front there is a driveway which provides off road parking, a laid to lawn area, a gravelled area, an Indian stone paved area and gated access to the path down the side of the property which leads to the rear garden.